Freedom Seekers came to Madison County from counties to our west (Adams) and south (Adair, Clarke). They left for the counties to our north (Dallas) and east (Warren). 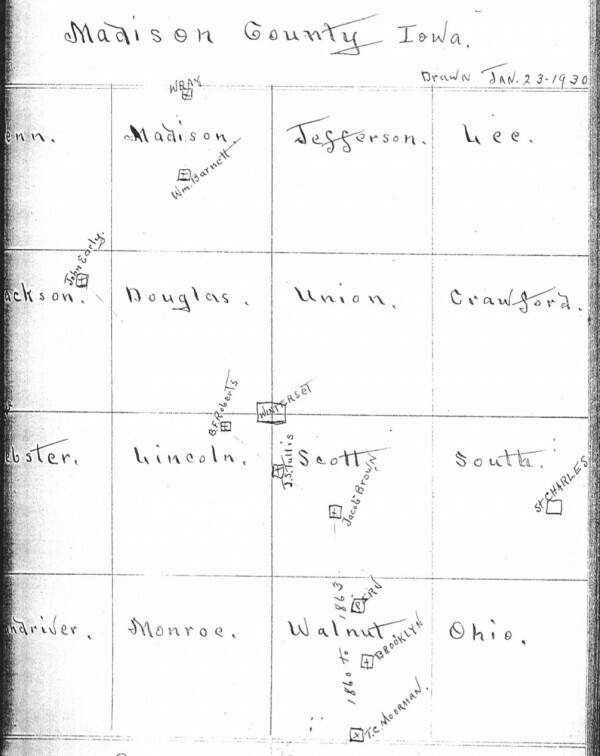 The actual trails begin to emerge as you read documented Madison County Underground Railroad accounts as well as those from the surrounding counties. Several Underground Railroad trails across Madison County have been identified through research and plotting the locations of the homes of those who participated as conductors and station masters. The majority of the trails now exist as rock roads and can be traveled by car. Here is one account that describes such a trail and those involved. Jesse Painter was a Quaker who came to Madison County in 1855 to live on the southern edge of Walnut Township. His escapades on the Underground Railroad with his Pennsylvania “old-fashioned scoop body, curtained all around” wagon were well known. Painter died in 1860 and his section of the route was put in the hands of his brother-in-law, Thomas Clarke Moorman, who lived on the border of Walnut and Ohio Townships. A.L. Tullis provided Cal Ogburn with a description of the trail. Tullis was the son of John Silvers Tullis, who was another conductor on this line. The first ‘stations,’ on the extreme southern border of Walnut township, were kept by Jesse Painter and his neighbor T.C. Moorman. My old friend A. L. Tullis, of Des Moines, was obliging enough to make for me, January 12, 1930, an outline map of Madison county, showing the location of this Road as it was in operation from 1860-1863, which has been supplemented with information from other sources, and establishes quite definitely this section of one of the cross-county, secret passages of fugitive on their way to Canada. 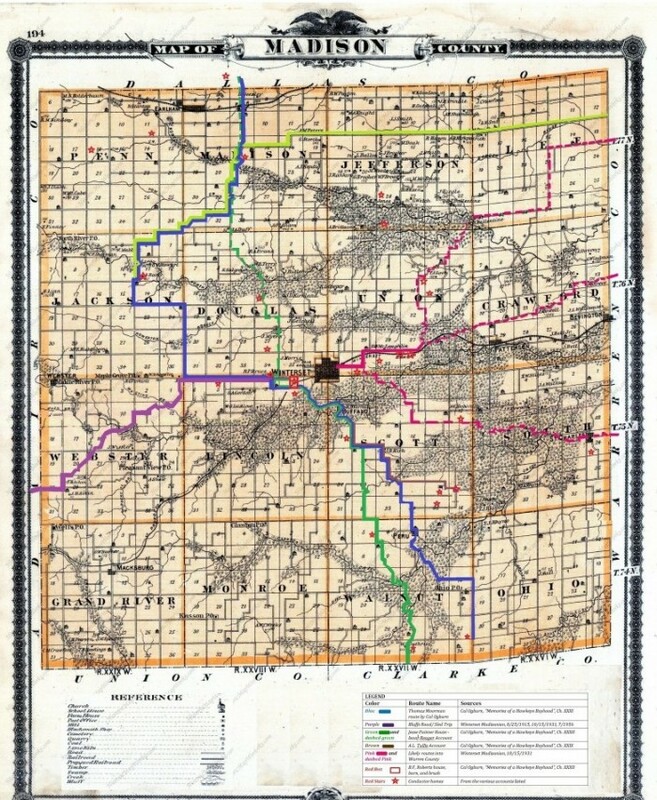 As traced by Mr. Tullis, this Road extended from Moorman’s northward to Jacob Brown’s, section 26, Scott township; thence northwestward to the home of J. S. Tullis, section 18, Scott township; from there, in the same direction, to where B. F. Roberts lived, in section 2, Lincoln township; from that point and still northwestward, to John Early’s, section 11, Jackson township. At Mr. Early’s the Road turned northeast, to William Barnett’s, section 16 Madison township, and from there it went northward into Dallas county.